The Seeing Eye GPS™ App in the iTunes Apple Store! The Seeing Eye GPS™ is a fully accessible turn-by-turn GPS iPhone app, available in the U.S. and Canada, with all the normal navigation features plus features unique to blind users. There are three choices for POI data (Apple, Foursquare, and OSM). Nearby Points of interest, heading, and intersections are automatically announced. Check out the User's Guide for details on all features. 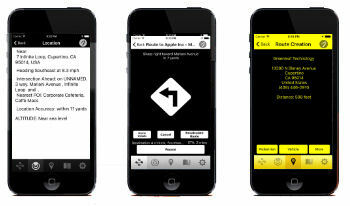 Purchase The Seeing Eye GPS™ App in iTunes - free to download, one month free trial available then requires subscription. You can give the gift of accessible GPS using an iTunes gift card. Note that some states charge tax, so be sure to add 10% to the purchase price just in case. See iTunes Gift cards website for details.